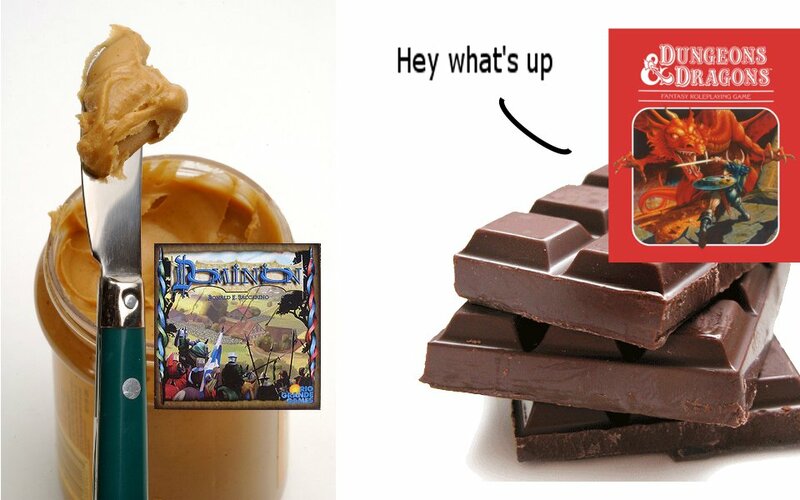 You got your Deckbuilding Peanut Butter in my RPG Chocolate | Action Points! So, Mike Krahulik (Gabe) from Penny Arcade is designing a deckbuilding RPG. From what I’ve read about it, it sounds like it has great potential and I am excited to learn more about it and even try it one day. It’s also got me thinking about convergent design. From the little that I’ve read about his game, it sounds like you start with a deck of about 30 cards that represent your character and you add cards to that deck as you play to represent you levelling-up and getting more skilled. I surmised from the description and the photos that you have Ability cards (Strength/Dexterity etc.) which act as resources to play out actions that you take as a character. It looks like it is being designed as a role playing game, which happens to use cards as its mechanic for resolving combat/challenges and track character progression. On the table top game to role playing game scale, it skews more toward the role playing game end. The Mage Knight board game, by Vlaada Chvaatil (I just learned how to pronounce his name this week, thanks to The Dice Tower podcast) is a deckbuilding RPG disguised as a board game. You have 4 characters with different skills you can unlock, and you perform actions using a deck of cards which you can add to as you play. It doesn’t handle things like skill checks, but you could co-opt the core deckbuilding mechanic into the combat mechanic and include an RPG shell which would handle the other role-playing and skill elements. On the table top game to role playing game scale, it skews more toward the table top game end. Both games are trying to accomplish different design goals, but have chosen to utilise similar mechanics. Incidentally, I have also been considering deckbuilding as a mechanic for a potential RPG style game. It’s interesting to see how different people converge on the same ideas/designs, while coming from different backgrounds and influences. Gabe’s article indicated that he came to the design from the World of Warcraft CCG (which is great), the Pokemon CCG, Dungeons & Dragons and Dominion (Obviously, and there’s also a Penny Arcade themed deckbuilding game). If you’re familiar with all these games, you can see how Gabe followed that thread and arrived at his decision to design a deckbuilding RPG. The World of Warcraft CCG did a great job in letting your deck represent your character, with decks being built around the Class of a character. If you set aside the ‘minion’ cards, every time you play a deck and play its Class abilities you really felt like you were playing that Class. You could customise your deck to represent a particular specialisation in a class, and the race of your character often had an impact too. However, the game does not represent character progression and spatial considerations (which Gabe mentioned in his post). Dungeons and Dragons (particularly 4th Edition, which Gabe started with) provides a good framework for how to handle character progression and tactical movement. If you were using the online character builder, you’d also be very familiar with having cards that represented your character’s powers and abilities. As you levelled up, you got more powers (cards) and also replaced your weaker powers with new ones. Finally, with Dominion, you get the idea that you can represent progression using cards throughout a game. As you play, cards get added to your deck and your play options expand as you go along. You can see that the different elements in these games lead to the conclusion of an RPG that uses deckbuilding to represent character progression. I have not read any articles by Vlaada Chvatil about how he came to design Mage Knight, but you can definitely see the bones of D&D (or his RPG of chooice) and Dominion in the design. I’m not sure if Vlaada came up with the game and mechanics first and then added the Mage Knight theme, or whether he was approached to design a game using the Mage Knight property and ended up with the mechanics. It fits the property pretty well, as I remember Mage Knight figures had combat dials that represented a sort of progression, as you would turn the dial as you take damage and change the properties of the figure. Nevertheless, I would think that the genesis of Mage Knight probably did not come about in the exact same way as Gabe’s game did. However, the fact that they both ended up with very similar mechanics even though the sources are different is what I call convergent design (as different people converge on similar solutions from different starting points). In this case, the starting points are probably not too different as Dominion and the concept of a role playing game are very evidently something they have in common. Even both the approaches to damage (useless Wound cards that get added to your deck, and you die if you have too many Wounds) can be traced back to the Curse cards in Dominion. The marriage of the deckbuilding and RPG will probably seem “obvious” to many, and I will bet that plenty of other people have come to the same conclusion and are right now designing their own deckbuilding RPG. One of them is right here typing out a pointless blog post. ZING! I’m just really interested when convergent design occurs. I wonder what other instances exist? How did the designers arrive at the end point? Did they share influences? If they didn’t what was the thought process that somehow led to them reaching similar design solutions? I think the answers to such questions are incredibly interesting and would shed a lot of light on design processes. Now for the “blowing my own trumpet” bit. I’ve been tossing around ideas for deckbuilding games since I played Dominion for the first time. Most of my initial ideas were to implement a deckbuilding component to represent resources in a larger strategic game. My idea for a deckbuilding RPG actually started out with an attempt to design a game around Team Fortress 2. I was thinking about how to implement critical hits, when I got the idea to have a damage deck which would have a tiny amount of Critical Damage cards. From this idea, I thought of implementing it in a MOBA style game, to represent different attack types and Critical Hits again. The MOBA game would necessitate some form of character progression and the deckbuilding mechanic for the damage component of the game seemed like a perfect fit for representing progression as well. Once again, different starting points leading to similar solutions. Incidentally, I’ve also talked about my first game design attempt many years ago which was trying to marry Chess with a CCG. It’s a very obvious source for a design and there have been many implementations (Summoner Wars, Battleground Fantasy Warfare etc.) which probably have similar mechanics. I wonder if this phenomenon should be called emergent design instead, since it seems to be more about “obvious” recombinations of mechanics from different existing games. Just some thoughts on how people come up with game designs. It’s actually motivating me even more, as I know that sometimes people can come up with similar designs independently but it requires dedication to hone that initial germ of an idea into a finished product. I’ve been bandying these little kernels around for some time, and I think I should start applying myself to actually turn some of these kernels into functional games. I just hope I can keep this up. ← Did you hear the one about 4 mechanics?